A fun and informative guide that shows what life is, how it works and why biology is more exciting today than ever before. Topics include characteristics of life, the human body, plants, evolution, ecology and the scientific method, all illustrated with humorous pictures and diagrams. Includes topical issues such as new discoveries, how the work of biologists can help protect the planet and stem cell research. With simple experiments to aid learning and internet links to recommended websites to find out more. An incredible encyclopaedia of all things biological. It provides an excellent introduction to various areas of biology such as botany, anatomy, marine biology and palaeontology, which will be sure to capture the attention of anyone with an interest in the topic. The book perfectly balances the use of biological terminology with providing a clear insight into a plethora of fascinating key biological discoveries like the structure of DNA and the components of a cell… This book will capture and challenge biology fans of any age - a perfect companion to the wonderful world of biology! I LOVE THIS BOOK BECAUSE IT TELLS ME ABOUT ALL THING IN VERY SHORT BUT IN DETAIL.THIS BOOK IS NOT JUST FOR CHILDREN IT CAN BE READ BY ADULT.I JUST WANT TO SAY THAT THIS BOOK IS MY FAVORITE BOOK THAT I HAVE EVER READ. A real-life scientist reviews What's biology all about? 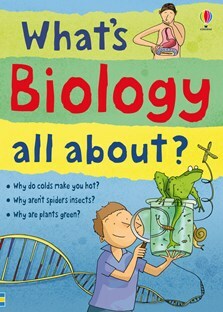 Dr Gemma Balmer reviews this, and other Usborne science books, on the Usborne blog - plus an exclusive Q&A.